Set a time in minutes to put the hard drives into standby mode when the system is idle to reduce the power consumption. Disk Standby Time Select a time from the drop-down menu (e.g. 10) to put the drive(s) into standby mode, when the system has been idle for more than the specified time. Hibernate Select a time from the drop-down menu (e.g. 60) to put the system into hibernation mode, when it has been idle for more than the specified time. 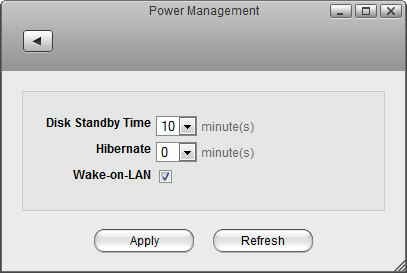 Wake-on-LAN Select the check-box to enable the Wake-on-LAN (WOL) function, allowing the network drive to be turned on or awakened by a network message. This function is only available for certain models (e.g. MyCloud Pro). Select 0 to disable the standby mode. There could be several reasons why a disk does not spin down even when you have set a time. It's possible that the HDD doesn't support sleep mode (e.g. USB HDD). It could be that some of the services need to access the disk (e.g. if you set the rescan interval for itunes or for the media server, it will access the disk at a certain interval and it cannot go into sleep mode) or it could be that some clients are accessing the disk on a regular interval (e.g. UPnP or DLNA client that is scanning for changes to the media files).